When an employee joins for a job, he or she is expected to make an effort to complete all the work and tasks that they are given. Moreover, employees should take notice that whenever an employee is offered an offer or a job, there is an implied promise that the employee is to complete the work that is offered to them. This implication should be followed at all times and this is what is called professionalism. Failure in fulfilling this promise has its own consequences. Also, taking up jobs that are not fit for your skill set should be completely avoided. Do not lie to your supervisor or your boss that you are working on the job, when in reality you are not putting effort to complete it within the deadline. Try to find jobs that are qualified for you and those in which you have complete confidence in completing. Try not to fail in everything that you said you could complete. This creates a feeling of distrust and in course of time you might be even fired. You were hired to make your boss’s job easier and not the opposite way. You should always be optimistic and positive while working and try not to create any unwanted drama at work. People who always talk about others behind their backs are considered as a menace, no matter how good and efficient they are in their work. Try not to be dull all the time and talk bad about your peers, fellow employees, subordinates and do not complain about your job, especially in front of others. Try not to make other’s jobs harder, as they are the ones that are fired first from the company. You should be considered as an employee who has less maintenance and is versatile and adaptable. You should not have any one tiptoeing around you just to make sure that you are doing your job right. Try not to violate the company policies just for your own needs and personal obligations. This means that it is professionally unethical to send out invitations to your co-workers to attend your party or to pressure them into attending social events that are related to you. 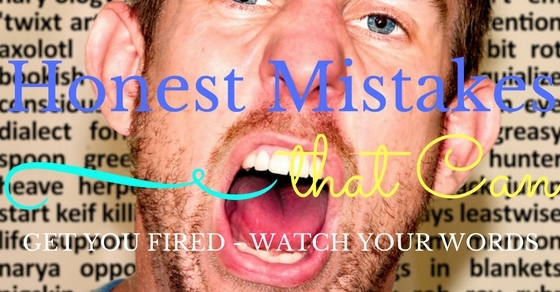 This is a mistake that most employees do intentionally or unintentionally. If found by the manager, even if you are a stellar performer at work, you will be side lined and ultimately fired by the company. Try to keep a barrier between professional and personal life. This is the basic fundamental value that every working employee should follow at any institution, organisation or a company. If you are not emotionally equipped to handle others and their feelings, chances are that you might get fired easily for the smallest of situations. Try to be nice to everyone as much as possible. Even if there is a person that you dislike, because of a reason do not show that disinterest at work. Try to put on a poker face and do not show any signs of comfortability when you are approaching the said person, this person can be your fellow employee, subordinate or even worse your boss. Try to handle the situation as cool as possible and think with a focused mind. Try to keep aside personal opinions for a while. Also, another main factor to keep in mind is that, try not to belittle others just because of your position. Yelling at others, shutting your subordinates when they speak, all these things will ultimately catch up with you in the course of time. Showing such behaviour at work shows how poorly developed and weak one’s emotional quotient is. Try to be as mature as possible while working, especially in the office. Many people do not think twice when they take company materials and supplies for their own personal use. Under company laws, this is considered as cheating. And if the price change is not too much, still it is not considered as a good method to borrow company resources for your personal use. Many employees are found taking whole packets of printer papers, pens, pamphlets for customers so that they could use it for various purposes at home. Also, many employees use their company’s name to exercise influence on many retailers and people so as to send their loved ones a personal gift. This should not be done. Try to think what would be the consequence if your boss finds you laundering the company resources for your own use and not bothering to pay back for it. Also, the aftermath for being fired for stealing can have its toll in your future prospective and plans. Usually many employees state their personal opinion to the public in the name of company’s views. This should not be done as it is considered as a misuse of company policy and company authority. Keep your beliefs and opinions aside, even if they clash with the company’s aims and values. A person should not be subjective in his or her opinion and should collectively consider what the company thinks of the situation. Using the company’s name just to make your point clear may not go down well with you and your subordinate and especially between you and your boss. The above said actions might be taken as you disobeying the company orders and instructions. This is an easy reason for you to get fired from the job. Being a team player is an essential part of one’s life as it includes meeting with different kinds of people and exploiting their knowledge and expertise just to get the job done. Try to be compatible with everyone as much as possible as this will not only make your work easier, but also make other’s work easier especially your supervisors. Think about it this way: you will not be judged by the amount of people that you have helped instead, you will be judged and measured by the amount of people that you have refused to help, be it a subordinate or a colleague. People might think of you as a selfish person who thinks about him/herself and doesn’t care much about others. Also, these kinds of actions won’t let you get fired that instant, but if the company is searching for people to be removed, the first thing they would weed out is people who are unhelpful and hard to get by. This is the main reason that so many employees get fired by their respective companies. Keep in mind that you are the representative of your company and when you post something derogatory or offensive you are in turn tarnishing the name of your company. Social media is place where, what is once said or posted cannot be taken back. You could delete the post, but what people see cannot be unseen. So always think twice before posting derogatory content or posts. Also, try not to offend anyone in the internet, as there are many ways in which these people could track you and you could be punishable for such actions. Another main reason why people get caught because of social media is by posting something funny and eye catching when you actually called sick to the office or you lied about having an urgent, personal obligation to attend. Once found by your boss or colleague, they will consider you as a liar and would judge you based on such actions. If your supervisor or your boss would be in this position, what kind of performance would he/she expect? Is there any kind of risk to the quality of my work? How will be the situation after 5-10 years? Would it still be the same or will the conditions change? What are the choices aligned with the person that you like? This mistake happens to all of us at least once in a while. Try to contact the related authority when mistakes like these happens. Try owning up for your mistakes and try to correct them as soon as possible. Most supervisors will brush it off as negligence. But if you try to cover your mistake and do not report to any one, then it is considered as a punishable act and you will be fired if anything unexpected happens to the company. Sending confidential email to anyone none other than your client is a case of information laundering and is considered as a serious offence. Such actions are against company rules and policies. If by mistake you have done such an error, report it to the office as soon as possible so that the counter measures could be taken as soon as possible. Whenever you are faced with a corporate dilemma, try to inform it to your supervisor and do not keep it as a secret. This is done so as to prevent the situation getting out of hand and stop it from escalating dangerously. Do not keep anything by yourself especially when it is about the company. Always keep in mind that your boss is there to monitor your work and to help you and guide you. This is applicable for employees who hold a top position within the company. Many employees take such personals as their role model and follow what they do. If you try to keep secrets from the company, it might have a bad influence on them and they would also follow the suit. If any emergencies occur because of you keeping a secret, then you will be first one to be fired from the company. Do no try to steal the authority and power of your colleague when they are not round. The main reason being that every employee in a company is trained differently, unless they are of the same position, so do not expect an employee to take decisions like a manager would. It takes years and years of experience and hard work just to get to that position. Also, taking decisions by an inexperienced individual could make the matters even worse and can complicate the situation. If you do not find the individual that has the power to make decisions do not take the control of the situation by yourself, instead try to find someone else who is equivalent in authority and give them the chance to make the final decision. People usually think that such mistakes can be easily escaped from and do not think much about the consequence it has on the company. Always try to be alert and try to make sure that whatever you do should follow the company rules and regulations.